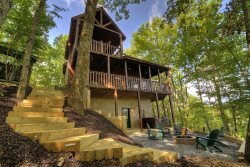 Retreat to the sound of rushing water & towering mountain laurel, A Whitewater Retreat will whisk your worries away! ONLY 25 FEET FROM THE BACK PORCH TO THE BANKS OF FIGHTING TOWN CREEK! Perfect for fishing, relaxing, and family fun! You will find easy living on popular Fightingtown Creek. Enjoy the water inside or out! A Whitewater Retreat is just the place to break out your waders and go fishing, stretch out on the sofa with your favorite book, or enjoy the screened porch while you listen to the rushing water. You will look forward to starting your day on the master bedroom deck; it is the perfect spot to sip an early morning cup of coffee while you listen as birds chirp their morning songs. After a day shopping in Blue Ridge or a hike on the Appalachian Trail you can soak away your sore muscles in the covered hot tub overlooking Fightingtown Creek. Inside you can hear the creek as it tumbles over the rocks and see it from every room in the living area. This home is tastefully decorated with plush, yet inviting, and warm furnishings. Located on popular Fighting Town Creek minutes from Blue Ridge, McCaysville & Copper Hill shopping,15 - 20 minutes to downtown Blue Ridge,10 - 15 minutes to downtown McCaysville. Great customer service, very thorough with explaining everything to us, helpful and friendly. What a wonderful getaway destination! The cabin was lovely, great location, clean, spacious and it had everything we needed. We loved our cabin! Everything was great! Inside of cabin was immaculate , but outside screens and swing could use a good cleaning. Not enough jets working on the hot tub. Overall, we loved it! The river is so relaxing and the front screened in porch is perfect for reading or napping! THE STAFF WAS SO GREAT AND NICE ALWAYS CALL AND CHECK ON US TO SEE IF WE NEEDED ANYTHING. CAN'T WAIT TO COME AGAIN. WAS VERY NICE AND REALLY LIKE THE CABIN ON THE CREEK IT WAS SO PEACEFUL AND QUIET. Very easy to deal with, very informative and overall great experience. The staff at Southern Comfort were wonderful. They made the whole process very easy. We loved the cabin. There was plenty of room for the 4 of us to spread out when it was time for alone time, but also had the perfect space for us to sit together in one room by the cozy fire to laugh and talk. The beautiful creek and noise from it were the icing on the cake. The furniture and beds were all very comfortable. It was a great weekend. SCCR was friendly and very helpful! We had such an enjoyable and relaxing time! Everything was so nice! Everyone was knowledgeable and super-friendly. LOVED the koozie!! We will always remember our days at Whitewater Retreat. It was the perfect place to celebrate our anniversary!